Can the Glowforge etch graphite? I use graphite supports for testing fuel cell components and would love to etch complex flow channels with GF. Literature says it is possible, but I don’t know if 40-45 watts is enough. Any thoughts/experiences? Only a thought… but graphite is very tolerant thermally, melts around 4,000K, but the thermal shock of the laser may flake it similar to how granite behaves. I wonder if instead of “melting” it you might be causing it to burn off. Perhaps you could elevate the level of Oxygen in the box and make it burn faster. I doubt that solid graphite would ever get away from you. That’s quite interesting! Is this your experiment? 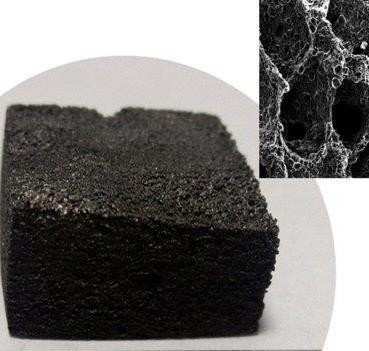 If so, you might heat a piece up again after the foam has been made, but this time with air to see if something like graphene oxide is made. It should become water soluble. This would then be a candidate for use with the Glowforge Nano technology and would represent a significant advance in technology as graphene oxide is somewhat difficult to make reliably. It should swell when soaked with water or alcohol. I wonder if the foam will allow air through it. It might work to absorb fumes from the Glowforge and it would come from a “green” source. That’s quite interesting! Is this your experiment? To say I am excited by this technology is an extreme understatement. If I can get some graphite I could give it a go. I wonder how it behaves thermally. I’ve seen a similar technique used to make charcoal from wood. I wonder if it the structure of the wonder bread that makes it into a carbon foam instead of just a lump of normal charcoal. Edit: The answer is yes, its because he did it with bread. That is crazy awesome. I need to bring this up at work! This suddenly reminded me of a project I have had on the back burner to make a material for fighting large forest fires. The idea is to find materials that rapidly form stable chars when placed in a fire to provide both a barrier to flame spread and also smother the flame. The simple example that most can relate to is the classic char formed by the holiday carbon snake pellets. The research topic is called intumescence.